Red Beet Apple Soup, a delicious soup of red beets, fresh fall apples, celery, and herbs that will keep you warm and cozy on cold weather nights. Did you love or hate beets as a child? I absolutely hated them, could not stand them. Fortunately for me my parents were also not fans of the root and thus we rarely ate them. When I was forced to encounter them on my plate they usually came soft and cold from the can which, as you can imagine, was not appetizing to a vegetable-averse child. But like many foods that children despise, I am now a reformed beet-loving adult (see also: brussels sprouts, turnips, parsnips, and broccoli). Whether it’s the rainbow colors of chiogga, the slight sweetness of golden, or the stain-inducing earthiness of red, I’m all about beets. 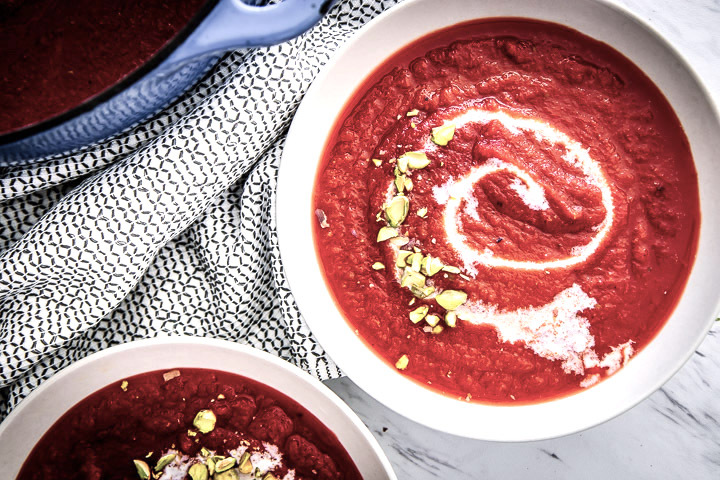 This Red Beet Apple Soup was a complete accident that turned into a major hit. I have cooked with beets a few times before but am in no way an expert, so I’m still experimenting with the roots and finding the best ways to prepare and the best flavor combinations. That’s what I love about cooking, you are able to play around in the kitchen to master and make an ingredient you’re own. My earlier experimentation led to the delicious Smoked Golden Beet Carpaccio Salad, which is still one of my favorite recent creations. I started cooking and testing recipes first with golden beets because their flavor is a bit more mild than their red counterparts – and they have propensity for creating a larger kitchen mess (hello beet fingers!). Basically golden beets are the “starter beet” and I was ready to move on to the big leagues. Red beets, and beets in general, are usually in season from late summer until late fall.In the United States the majority of beets are grown in the Northern Midwest or Northeastern states but other countries with high amounts of beet cultivation include Germany, Turkey, Russia, and France. Beets store well in refrigerator crisper drawers, and also are great for preserving and pickling, so can be enjoyed throughout the year. Beetroots pack a nutrition punch and are high in fiber and mineral such as folate and manganese. The leaves of bets, or “beet greens,” are also popular (primarily outside the United States) and are high in many vitamins and minerals, including vitamin A, vitamin C, vitamin K, and iron. The great news about table beets (the beets sold to be eaten whole) is that organic cultivation is common. Because beets are grown in temperate climates in many areas of the world and especially the United States, many regions are likely to have beets grown locally. Another great beet sustainability hack is the fact that beet leaves are also edible. Root to tip eating at its best! However there is one caveat about beets – the majority of worldwide beet cultivation is for sugar beets, which are grown and boiled down to table sugar. According to the United States Department of Agriculture, the major (55%) of table sugar production comes from sugar beets and 95% of sugar beets are genetically modified varieties. Reducing your use of added table sugar and sourcing from GMO-free and organic sugar beets farms can help combat the issue. 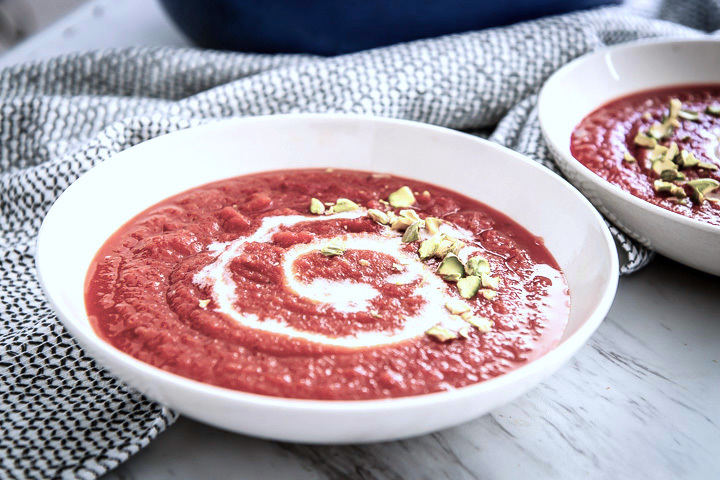 This Red Beet Apple Soup is an easy, cozy, comfort food recipe for fall and early winter. Beets can be intimidating to cook at first but a few easy tricks and tools will make this soup a staple on your November and December menus. How to easily peel beets: If you’ve ever tried to peel beets raw you’ll know it’s no easy feat. However, there is an easy trick to save you time (and elbow grease) and peel beets perfectly every time. Roasting and boiling beets are the common ways to cook beets and thankfully they also make peeling super simple. Roast or boil beets until they are soft on the inside, let cool, and then use a spoon or dishcloth (if you don’t mind stains) and slide of skin. Easy peasy! Eat beets root to tip. Don’t throw away those beet leaves! Beet leaves are packed with nutrients, and completely edible so don’t trash those tips. Beet leaves are delicious in salads, soups, or sauteed as a side item. Baked, light fried, and dried beets make a delicious snack. Beets are a great veggie for baking, drying, or lightly frying into afternoon snacks. Slice beets thinly with a knife or vegetable slicer or use this handy vegetable spiralizer to prep beet snacks. A lifesaving soup pot and immersion blender. If you’re serious about soups like I am, buy yourself a sturdy soup pot or dutch oven and an immersion blender. I’m partial to green/sustainable cookware and love this Cusinart Green Gourmet cookware set, but also love my go-to ceramic dutch oven. Also, get yourself an immersion blender. Your soup game will go next level. Preheat oven to 350 degrees. Place whole beets on a glass baking dish (a cookie sheet will work as well) and bake about 20-30 minutes, or until beets are soft throughout. Remove and let cool. When beets are cool, remove skins with a spoon or towel and slice into small chunks. Heat olive oil over medium heat in a dutch oven or soup pot. Add beets, apples, celery, onion and garlic and cook for about 5-8 minutes, or until they soften and start to brown. Add vegetable broth and bring to a boil, then add fresh herbs and simmer over medium-low heat for about 20-30 minutes. Take soup off heat and blend with an immersion blender until smooth. Add salt and pepper or more spices to taste. Serve with an optional drizzle of coconut milk, yogurt, or cream. Enjoy! Leftovers & Storage: In my opinion soups are always better over time. This soup can be refrigerated for 5-6 days and will only get better with time. It can also be frozen and eaten throughout the cold weather season. LOVE THIS RED BEET APPLE SOUP? 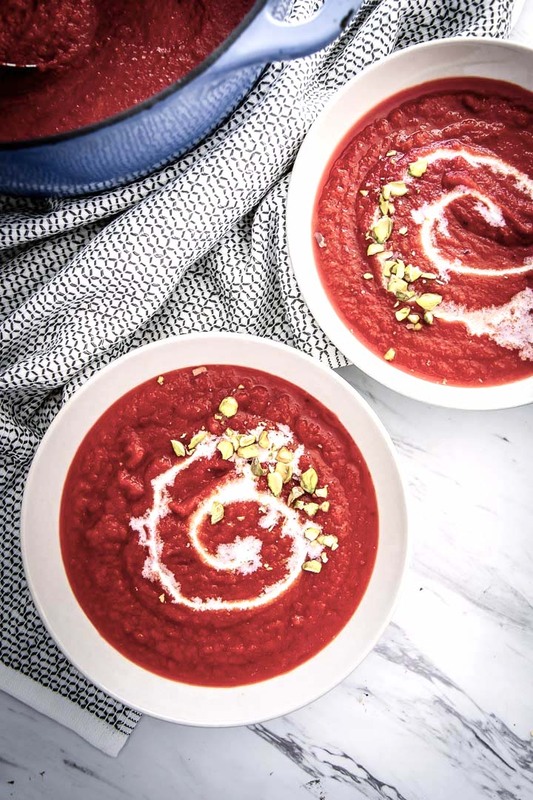 Loving this Red Beet Apple Soup recipe? Try another of my favorite fall and winter soup recipes. 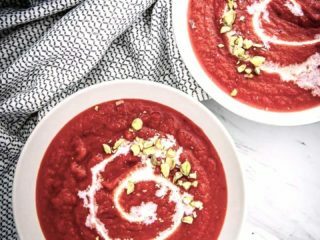 I hope you enjoy this sweet and savory Red Beet Apple Soup recipe, it’s the perfect cozy meal for cold weather night. Do you have a favorite beet soup recipe? Leave me a link below! Look forward to more recipes on the beet – 2018 is the Year of the Beet says National Garden Bureau! Easy to grow from seed and delicious (when you have good recipes)! That’s great news! I love beets and I would like to see them used by more home cooks. Delicious and nutritious!